Did you think that Bite Beauty was just about innovative color for lips? If so, you would be wrong. Now Bite Beauty is pushing the envelope even further with what kind of treatments can be created to improve the look and feel of lips. 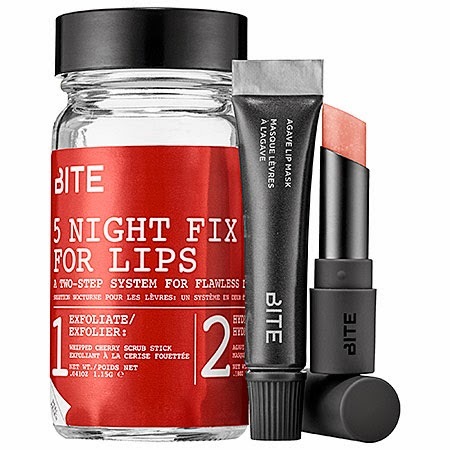 The Bite Beauty 5 Night Fix for Lips packaging is super cute, and with two deluxe mini sized products, I found this was perfect for travel or to bring to the office to apply before adding new lip color for a night out, for example. The scrub is in a tube format, which makes it very easy to swipe a few times over the lips and exfoliate off any dry, flaky skin. The flavor is a yummy Whipped Cherry that I loved! The exfoliating grains in the tube are gentle, but strong enough that I did see smoother, softer lips after wiping off. The scrub contains castor oil, as well as fruit extracts to help brighten and restore lips, so I didn't experience any pair or irritation after using. Then I added the mini Agave Mask, with a yummy Vanilla flavor. (I've also featured the Bite Beauty lip mask here and here). The mask felt soothing after the scrub, and hydrated my lips through the night, so I woke up with much softer, plumper lips. I began my testing of this product by using it 5 Nights in a row, and yes, I could definitely see and feel a difference in my lips and how my lipsticks went on the next morning. After this 5 Night period, I have continued to use it a few nights a week as needed.